I love fall flavors and colors. 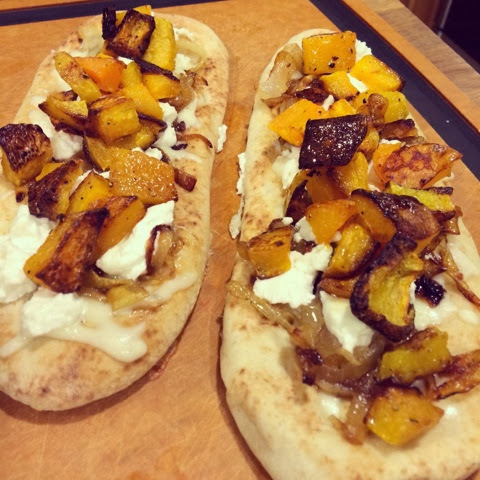 Fall and winter recipes tend to be warm, comforting and sometimes a bit heavy so I was very happy to come across this delightfully sized flatbread recipe which incorporates a fall heavy hitter, butternut squash. The smaller more personal size of these butternut squash flatbreads allows for each ingredient to shine through and this would also be a great appetizer at a party. It is a fairly simple recipe and you can take a couple of shortcuts to make it even more streamlined, such as pre-cut butternut squash and store bought flat bread, naan or even pita bread would work. 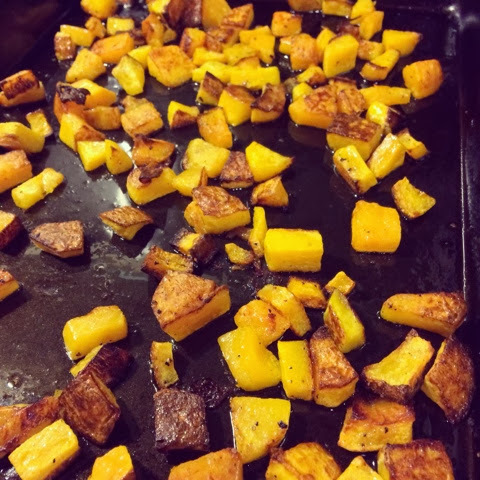 Lightly toss the cubed butternut with olive oil and salt and pepper. 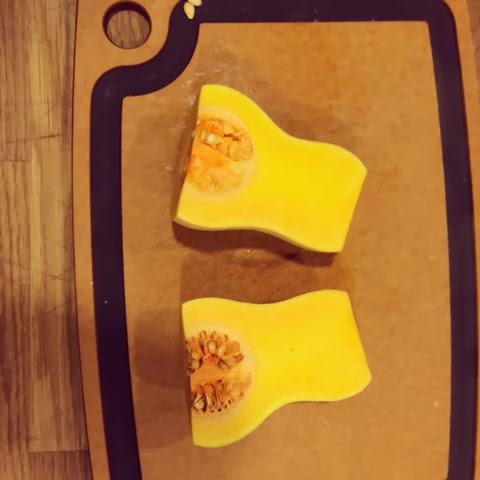 Place on a cookie sheet and put into the oven, cooking 30-40 minutes until the squash it golden brown and soft. 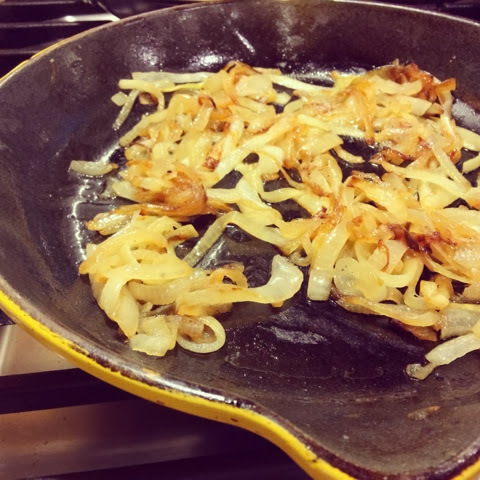 Meanwhile, in a small pan heat up one tablespoon of butter with one tablespoon of olive oil and add the onion and garlic, cook until caramelized. Reduce the oven to 350 degrees. Add the balsamic vinegar to a clean, small saucepan and bring to a boil then reduce heat to simmer until the volume is reduced to half. 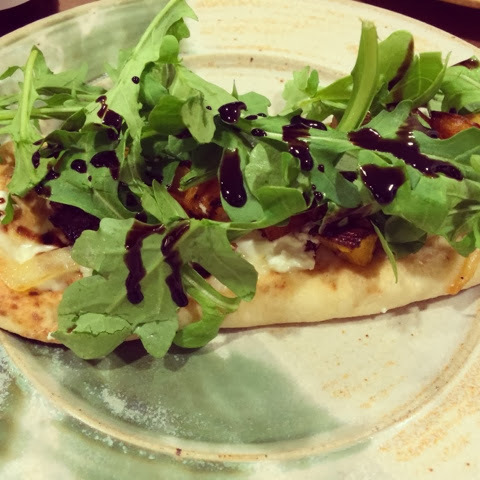 Gather the flatbreads and crumble a couple of oz of goat cheese, then sprinkle a little bit of mozz on top, now add the caramelized onion and butternut squash. Carefully put the flatbreads into the oven for about 10 mins until everything is warmed through and soft. Lastly add the washed and dried arugula to the top and drizzle with a little bit of the reduced balsamic vinegar. crunchy, brown bits of butternut squash deliciousness. the beautiful finished product, all dressed up and ready to be eaten. slightly adapted from this heatheromade recipe via Lauren Conrad.